Motherwell dismantled Cove Rangers to reach the last 16 of the Scottish Cup for the first time in four seasons. Louis Moult headed his 13th goal of the season with barely a minute on the clock and Scott McDonald doubled Well's lead soon after. The Steelmen were four ahead at the break thanks to further strikes by Marvin Johnson and Stephen Pearson. Another for Pearson made it five on the day for Motherwell, who are now unbeaten in their last six matches. It must be one of the most settling feelings for a manager when, faced with an awkward tie in the Scottish Cup you are expected to win, your team puts things beyond doubt early in the match without any sort of major fright. That is exactly how it panned out for Mark McGhee's Motherwell, who took just over 60 seconds to assert their authority over their Highland League opponents and it was a welcome change given they have failed to get past this stage in the previous three seasons. Moult is one of the few success stories from previous boss Ian Baraclough's reign at Fir Park, and the Englishman's back post header from Josh Law's cross was the kind of start the the visitors would have had nightmares about. Cove caved in very quickly. More hesitancy at the back and McDonald's neat one-two with Pearson resulted in a sweet left-footed finish from the Aussie into the bottom left corner beyond Cove goalkeeper Stuart McKenzie. The away defenders looked at each other and perhaps wished they could get back on the team bus early. It was a 300 mile round trip for Cove Rangers, who had played six Scottish Cup games to reach this stage and a surging run and fine drive by Blair Yule offered a glimmer of hope. But they would concede two more before the break. Johnson had been pinging shots at goal regularly and eventually hit the back of the net when Stevie Hammell's low pass set him up to score in off the underside of the bar. Motherwell's fourth came from a blisteringly quick counter-attack. Liam Grimshaw fed Moult who played the ball into Pearson's path to place the ball in the far corner. The former Scotland midfielder scored with a near identical finish to make it 5-0 soon after the break following a nice pass by substitute Lionel Ainsworth. Cove were dead and buried but Daryl Nicol forced a good low save from Motherwell's Connor Ripley to give the away fans reason to get on their feet. The home support offered generous applause for the introduction of James McFadden - who should have scored - and also a kind ripple of acknowledgement when it was announced over the tannoy that 312 Cove Rangers fans had made the ultimately futile trip. Hammell cruelly even cleared Nicol's late effort off the line to deny Cove a crumb of comfort. Match ends, Motherwell 5, Cove Rangers 0. Second Half ends, Motherwell 5, Cove Rangers 0. Attempt saved. Daryl Nicol (Cove Rangers) right footed shot from the centre of the box is saved in the centre of the goal. Attempt saved. Scott McDonald (Motherwell) header from the centre of the box is saved in the top centre of the goal. Corner, Motherwell. Conceded by Darryn Kelly. Corner, Motherwell. Conceded by Stuart Walker. Sam Burnett (Cove Rangers) wins a free kick on the right wing. Attempt missed. Sam Burnett (Cove Rangers) right footed shot from outside the box is too high. Substitution, Cove Rangers. Jamie Watt replaces Conor Scully. Corner, Cove Rangers. Conceded by Steven Hammell. Attempt saved. Scott McDonald (Motherwell) right footed shot from the centre of the box is saved in the top centre of the goal. Corner, Motherwell. Conceded by Conor Scully. Attempt saved. 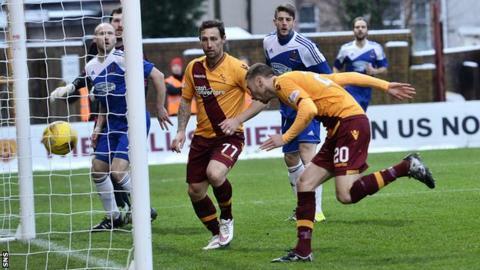 James McFadden (Motherwell) right footed shot from the centre of the box is saved in the centre of the goal. Substitution, Cove Rangers. Sam Burnett replaces Eric Watson. Corner, Motherwell. Conceded by Stuart McKenzie. Attempt saved. Scott McDonald (Motherwell) right footed shot from the right side of the box is saved in the bottom right corner. Attempt missed. Stirling Smith (Cove Rangers) right footed shot from outside the box misses to the left. Substitution, Motherwell. Dom Thomas replaces Stephen Pearson. Attempt missed. James McFadden (Motherwell) right footed shot from the left side of the box misses to the left. Stephen Pearson (Motherwell) wins a free kick on the left wing. Foul by Stuart Duff (Cove Rangers). Substitution, Cove Rangers. Jonny Smith replaces Daniel Park. Foul by James McFadden (Motherwell). Alan Redford (Cove Rangers) wins a free kick in the defensive half. Attempt saved. Conor Scully (Cove Rangers) right footed shot from outside the box is saved in the top centre of the goal. Keith Lasley (Motherwell) wins a free kick on the right wing. Foul by Blair Yule (Cove Rangers). Corner, Cove Rangers. Conceded by Connor Ripley. Attempt saved. Daryl Nicol (Cove Rangers) right footed shot from the right side of the box is saved in the centre of the goal. Goal! Motherwell 5, Cove Rangers 0. Stephen Pearson (Motherwell) left footed shot from the left side of the box to the bottom right corner. Assisted by Lionel Ainsworth. Daniel Park (Cove Rangers) wins a free kick on the right wing. Attempt missed. Daryl Nicol (Cove Rangers) right footed shot from outside the box is too high. Attempt blocked. Lionel Ainsworth (Motherwell) right footed shot from a difficult angle on the right is blocked. Substitution, Motherwell. James McFadden replaces Louis Moult. Substitution, Motherwell. Lionel Ainsworth replaces Marvin Johnson.